Tom hears a ghost story on the radio and is spooked by it; Jerry notices this and takes advantage of it, using a variety of tricks to scare Tom. Tom and another cat fight over Jerry. 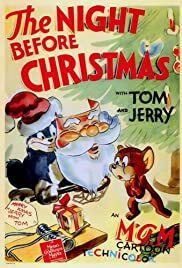 One of the best of the early Tom and Jerry cartoon shorts. It's Christmas night and Jerry is under the tree play with the various gifts left by Santa. Soon he starts jumping on Tom thinking he's a gift and soon the two are back to their fighting ways. The third short in the series has all the classic chases that you'd expect from the series but it also has a bit more heart since this was released around the holidays. The animation is really what stands out here and especially how colorful it was. The scene under the tree are especially beautiful looking and we also get some nice laughs once the fighting starts. The ending is quite nice as the two make up and play nice for once.